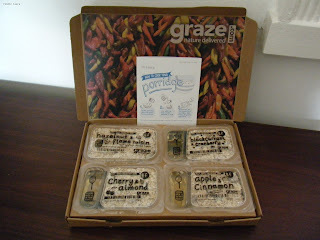 I received four pots on porridge through my door this weekend, it was the new Graze breakfast box. As someone who is notorious for skipping breakfast these boxes seemed like a great idea. In a similar way to the Graze snack boxes you can chose which toppings to add to your porridge and there is a great selection of fruit and nuts to pick from and you get a little pot of honey too. It's not difficult to make up the porridge, in fact the pack that it comes in even doubles up as a measuring cup. It's just not quite as convenient as the 'grab it and go' style which was what attracted me to the original Graze box. I used to have the Graze snack boxes regularly but I never used them properly and would finish off a box in an evening in front of the TV rather than rationing out the snacks over a few days. The snacks were always great quality and tasty. Plus, you can decide if you want a healthy box or a treat box. It's easy to stop and start deliveries of the boxes and you're not tied into receiving a certain number of boxes. Graze often sends offers through by email which was how I found out about the porridge. You are paying for the convenience of having these boxes prepared and mailed to you. If you were organised with the shopping you could prepare something like this for yourself (and your family) at the start of every week. Although, you would need to buy a lot of snacks to have the same variety that Graze offers. Have you tried the Graze porridge box or had the original snack box? Use the link below to try a box for free.